Some physicists believe that the Pyramid is not only an accumulator of energies, but also a modifier of these same energies. It is known that any object within which energy vibrates is capable of acting as a resonating cavity. It is also known that the energy is focused at a certain point within the object, whether it is hollow or solid. Thus it is thought that the Pyramid may act as a huge resonating cavity which is able to focus energies of the cosmos like a giant lens. This focused energy would affect the molecules or crystals of any object in the path of the beam of focused energy. Some even equate it to an invisible Laser beam, having a different frequency and strength of affect. We find it particularly interesting that so far, very few reports of negative effects have been circulated about the pyramid. Unlike virtually all other occult paraphernalia, such as ouija boards and pendulae, the pyramid seems to have powers which are almost always either beneficial or neutral. Of course, some mystics complain that when they spend a great deal of time inside of a pyramid for meditational purposes, they actually received “too much energy,” or feel “overcharged.” This, of course, would be the fault of the meditator, for not controlling his use of the pyramid, and not the fault of the pyramid itself. The only report of truly negative effects we have heard to date is that of E.S.P. laboratory’s experimenters who claim that standing in a specific portion of a large pyramid gave them a headache in short order. While the energies of the pyramid may, as yet, be inexplicable, there are some energies inside and surrounding the pyramid which are most certainly measurable. Through the use of radiesthesia, or dowsing rods, researchers have been able to show that there is an helical vortex of energy emanating from the apex of the pyramid which actually expands in diameter as it rises higher and higher. Using small cardboard pyramids only 4 inches high, dowsers have demonstrated that this vortex can reach a height of nearly 8 feet over the apex, and expand to a diameter of almost 6 feet. In a controlled experiment to demonstrate the existence of this vortex of energy, one miniature pyramid was placed underneath one of three identical cardboard boxes. The dowser, not knowing which box concealed the pyramid, then tested each one with his rod. The rod reacted only over the box with the pyramid. Of all the energies of the pyramid, perhaps the best-known is its mysterious ability to keep razor blades sharp. This ability was first brought to the attention of the public by Karl Drbal, a Czechoslovakian researcher, who has been experimenting with pyramid shapes since the early 1940’s. During the 1950’s, in Prague, he received patent number 91304 on a pyramid which he used to prolong the longevity of razor blades. Although some scientists in various parts of the world have been cognizant of the Drbal patent, it was not until the publication of Psychic Discoveries Behind the Iron Curtain, that the general public became aware of Drbal’s claim for the energies of pyramid shapes. Since the inception of this mass recognition, numerous research studies have been conducted throughout the world to support or validate these claims. Although there is no clear consensus in the scientific community as to the effectiveness of the pyramid in maintaining the sharpness of razor blades, hundreds of undocumented experiments have been performed by laymen which support the sharpening ability of the pyramid. Apparently convinced that the much-touted Flower Power of the 60’s is being replaced, in this decade, by Pyramid Power, many commercial firms have jumped on this seemingly lucrative bandwagon. One firm in Michigan offers a standard cardboard pyramid and a not-so-standard one which, when one peers through its apex, offers an entertaining variety of figures, forms and scenes, ostensibly visions from the past. This same company also sells a shaving cream bomb to be used in conjunction with the razor blade to be stored in the pyramid. A California firm also offers a model pyramid, but its main item is a large pyramid, made of plastic sheeting, which resembles a translucent Cub Scouts’ pup tent. This pyramid is sold and used primarily for meditation purposes, although many rejuvenating effects have been attributed to it. Still another product sold by this firm is a plate, ostensibly “charged” inside a pyramid, which is supposed to alter the taste of foods, tobacco and liquor. The manufacturers suggest that one of the possible uses of this plate is to aid in the growth of ordinary house plants. Allegedly, water which is left for several hours a day on this plate, and then poured over plants, will help your greenery flourish. Not all pyramid distributors are aiming at a mystical or occult market. A leading mail order firm of scientific supplies and equipment has two types of pyramids listed in its latest catalogue a clear plastic model and a cardboard model. While this company does not make any claims for the energies of the pyramid, they do offer it as an item which might be of interest to students searching for experimental subjects for science fair projects. While we were not, at this time, able to ascertain how well these distribution companies are doing financially, we can state with conviction that the pyramid is definitely a saleable item. And the purchasers are using their miniature pyramids for everything from thought-form incubators to experimental devices to razor blade containers. One of the most far-out uses of a table model pyramid which has come to our attention is as a storage place for lottery tickets. The reports of people winning with pyramid- stored lottery tickets are numerous. This does not necessarily mean that the pyramid actually has the power to help the owners of the tickets to win lotteries. It could merely mean that the people who placed lottery tickets inside pyramids, and lost, are keeping this information to themselves. Other reports, even more difficult to substantiate, come from people who claim that when they placed a model pyramid near their beds or chairs, after several nights of sleep, or several days of sitting near the pyramid, a specific pain or symptom of illness either disappeared or was greatly alleviated. Pyramid tents are now being used for activities which range from sleep to rigorous exercise. Some people who have used the pyramid for meditational purposes claim they have reached better and deeper levels of meditation when they were inside. 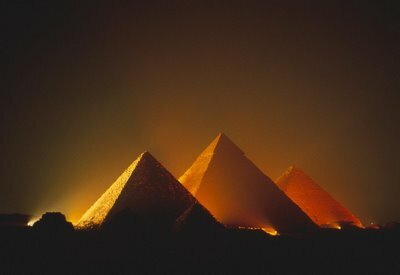 Other people who have slept in pyramids claim that they could not do so for more than three nights in a row, because they were so energized that they could not cope with the dynamo effects they experienced. The energy experienced by these persons is so great that it cannot be explained, as some authorities have attempted to do, by ascribing it to the placebo effect, the phenomenon whereby an individual responds, not to an actual occurrence or stimulus, but to the suggestion of such an occurrence or stimulus. Others who have worn them claim that these pyramid hats definitely relieve headaches. The history of conical hats used for religious and mystical purpose is a long one. It can actually, according to one psychic, be traced back to the Egyptian priests who wore pyramid hats when they were trying to contact their sun god, Ra. It has been speculated that these hats actually focused electromagnetic energy from the sun or from some higher metaphysical plane. If this reasoning is correct, the wearers of these hats would have been the possessors of special energies and would therefore naturally have been accorded the awe and respect of the masses. J. Forlong, in Rivers of Life, also claims that cone hats were originally connected with solar worship. They later came to denote professional status and were worn, not only by sorcerers, but by priests and kings. These hats were always decorated to clearly identify the sect and rank (of nobility) of the wearer. Forlong notes that the common priest’s hat was a cone of very considerable dimensions. Derivative of this conical headgear, says Forlong, was the early musician’s hat shaped like a fish with its tail uppermost. One New York medium apparently doesn’t need a conical hat to receive the benefit of the energies of the geometric shape. In Seth Materials, Jane Roberts writes that under certain conditions, “I got the feeling that a cone came down just over my head. I didn’t think that an actual physical cone was there, but the idea of shape was definite. The wide end was to relative differences in water evaporation and perhaps on the presence of relatively different areas of blotter paper (used as bases for the structures).